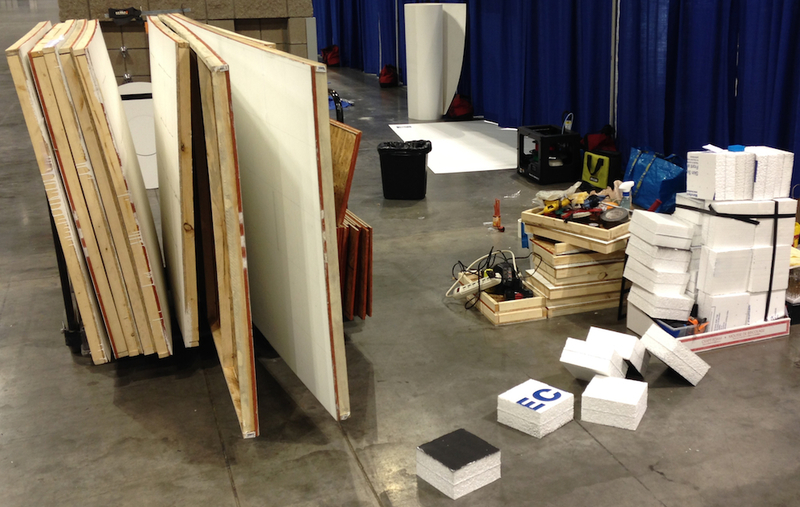 Materials used to produce International Robot Olympiad competition events. The 2013 (15th annual) International Robot Olympiad competition has come to a close. Next year it will take place in Beijing, China, and is tentatively scheduled for October. Between 400 and 500 young people from 10 countries (including Canada and Mexico, as well as the U.S.) participated in this year’s event, and there would have been approximately 60 more had the bulk of the Indonesian team not been prevented from obtaining visas. In categories involving play-fields laid out on platforms, in which the objective is generally some combination of following a line and/or navigating a maze and/or moving objects around, success breeds imitation, so one year’s winner sets the pattern for the following year’s entrants. Frequently the winning robots are assembled from commercially available kits that are optimized for particular categories, so if a new commercial kit comes along and steals the show one year, it’s likely that everyone will have a robot built from that kit the following year. This is the real reason why robots in these events look so similar. Several categories are exceptions to much of the above. In the Creative Category, teams of up to three participants develop and construct their own designs in response to the theme chosen for the current year’s Olympiad. These may arrive in parts, but it’s more likely for shipping purposes than because of any such requirement. The photos in my previous report were all of entries in the Creative Category. There is also a Robot Dance category in which participants choose their own music and program a humanoid robot to dance to it, and a Robot in Movie category in which they first submit a storyboard and then produce and edit a video based upon it. In the Mission Challenge category (yes, the word “Challenge” is overloaded) the judges exercise more latitude than in other categories, collaborating to create a task they think the participants will find challenging, and the onus is on the participants to be prepared for whatever the judges might put in front of them. The box of parts they bring for this category therefore needs to be unusually flexible. This year the Mission Challenge, Challenge Division involved wheeled robots climbing an inclined trough made of loose fabric, which was gathered toward the upper end. It sounds simple enough, but more often than not the robots would only make it part way up and then start flipping over, again and again, or get their wheels wrapped up in the gathers near the top. In the Mission Challenge, Junior Division, robots attempted to traverse a rail made of pipe, which was inclined and had a section in the middle that flared out to a slightly larger diameter. Again, this proved more difficult than it would seem to be. The issue of commercial kits and assembled robots is a bit of a sore point for some. In the dance event, for example, there is a popular product that runs about $1500, but for four times that you can get a better one with additional degrees of freedom that allow more flexible choreography. Of course not everyone can afford the more expensive one, so those who can are able to buy a competitive advantage, although they still have to make good use of it to gain anything by doing so. The following are video excerpts from three event categories involving platform play-fields, ordered from shortest to longest. I’m not going to attempt to say which video belongs to which category, because I’d probably get it wrong.